So after 3 months of hard work, we are finally ready to release the premium version of the Easy Coming Soon Plugin. In this post I will walk you through the features and the benefit of the plugin. The easy Coming Soon plugin allows you to engage your visitors and capture their email address. The inbuilt Design Options allows you to customize the look without any coding. Blogs have steadily moved from being a medium to vent out something, to a business. It’s no more just a platform to express yourself, but to make a great deal of money as well. There are various ways to monetize a blog if it’s getting a steady flow of traffic, and most of them can run simultaneously. While most of the bloggers rely only on advertisement income, some go out of the way to maximize their blog revenue by using multiple streams. 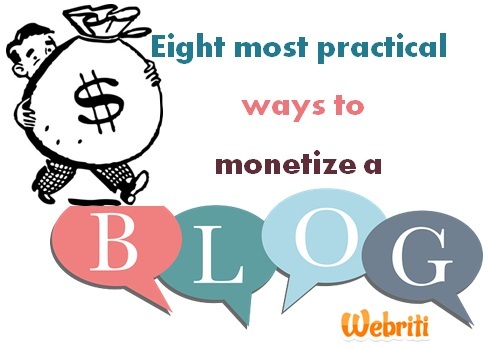 Here we list eight different monetizing strategies which are most popular amongst the bloggers across the globe. Advertisement is hands down the best monetization technique for any kind of website. However, how you manage your ad inventory makes a lot of impact on how much you earn. The first thing you need to know about is the types of ads based on the way they earn money. – CPC (cost per click) and CPM (cost per mile): These are essentially parameters by which ad companies pay you. In CPC, the companies pay you a certain (fixed or variable) amount per click on the ads posted on your blog. In CPM, you are paid a fixed amount per thousand impressions of the ad unit. Leading CPC and CPM companies are Google Adsense, Media.net, Chitika etc. – Sell ad space: You can also opt to sell some ad space on your blog for a fixed price. The spaces are sold for a certain period of time and the payout is independent of events like click or impression. You can choose to sell the ad slots directly on your blog or some webmaster’s forums (e.g. Digitalpoint, Warriorforums etc.) or through a third party service like BuySellAds.com. Tip: Use a combination of both the techniques to maximize the ad revenue from your blog. Affiliate marketing is another popular way of monetizing your blog. It essentially means tying up with affiliate marketing companies such as Clickbank and Commission Junction, or joining e-commerce site such as Amazon, who pay you commission for the products sold through your affiliate links. Affiliate marketing is recommended if you are running a blog related to product reviews, launch coverage, price comparison etc. If you want to be successful in affiliate marketing, you must provide consistent quality material on a regular basis, and make your blog a brand. This often takes more than a solo effort and you may probably need a team of writers, designers and web developers to be successful. If your readers bank on your reviews, the product owners will be happy to offer you products to do hands on, more often for a charge. This generally works well if you have a high traffic count and have established yourself as someone with an honest opinion. Sites like PayPerPost, SponsoredReviews and ReviewMe are popular options for first timers, and as you gain in reputation, companies would directly approach you to test their products. Tip: A paid review doesn’t necessarily mean that you always praise the product. Accepting to write a dishonest review might earn you some quick bucks, but hits you hard in the long run. Guest posting is considered as the most effective search engine optimization techniques now-a-days. If you have an authoritative blog, you might allow other bloggers or website owners to write guest posts on your blog, and charge for it. This works excellent if your blog has a high page rank in addition to a great traffic. URL shortening websites shorten a long web URL to only a few characters, serving various purposes e.g. reduce the character count to post in micro blogging sites like Twitter, bypass security that have filters against particular words, cloak an affiliate link, back link anonymously etc. Lately, many companies have started monetizing with this technique by taking the users to an advertisement page before redirecting to the original link. You can make money with this technique, if you link out a lot. Adf.ly is the leading URL shortening company which pays you on per click basis. If you are providing some downloadable content to your readers on a regular basis, you may host these files on a third party website, and earn money every time it’s downloaded (Pay per download). These file hosting companies sell memberships for a small fee and provide additional benefits to subscribed downloaders. Leading companies which pay you for sharing files through them are ShareCash, DepositFiles, Uploading.com etc. Tip: Both the URL shorteners and file hosting techniques are used mostly by the people involved in distribution of pirated contents. Use these methods with caution if you are running a legitimate blog. If a picture speaks thousand words, a video must utter a million. Rather than writing a multipage tutorial, it could be a good idea to upload a video on YouTube. This concept goes well with product reviews as well. Videos posted on YouTube could be monetized easily by linking it with your Adsense account. You can also embed the videos on your blog to increase the views and earnings. Do you feel your blog’s traffic has gone stagnant now? Are you running out of ideas to keep your blog interesting and appealing to people, and push the traffic further? If earning money was your prime motive behind building the blog, you might plan for an exit at this point. List your website on Flippa and let it go for a handsome amount. What are your prime monetization techniques? Did we miss some great strategy here? Let us know your views via comments.